Summer 2017 - Join Us in Fredericton! This is our last newsletter before the Convention in August, and the next Annual General Meeting. As the outgoing President, I wish to thank you for giving me the opportunity to serve, and to learn. This is my 6th year on the board, and the first time I’ve served in the role as president. I will not be sitting on the board next term. For personal reasons, I need to take a break from board duties. I have a list of things I’d like to be doing as an HKVCA volunteer, and I hope to pursue one or two. Atlantic Region has put together an enticing schedule of events for the convention this August. I wish everyone a wonderful time, and perfect weather. Unfortunately, I will not be attending the whole convention because my husband’s niece is getting married that same weekend, but I will be there for the AGM. While weddings are always joyful, I have to say that I am sorry I can’t be in two places at once! Winter has passed and we have survived another one! I suppose that I should go to the sunny south as so many of my friends do, but I don’t have the energy to suffer the waits at airports and hotel lobbies. ”Ole rockin chair’s got me”. Recently we mourn the passing of a lovely lady, Lyla Stimson, widow of the late HK Vet, Ken Beatty. Of all the wonderful stories that have emerged from the horrors of World War II, this one ranks among the best. Ken Beatty was a prisoner in a camp near Tokyo when the war was over. The American Air Force flew over all the POW camps and dropped food and clothing for the prisoners. I remember the parachuting of supplies to our camp, the most wonderful experience for all of us who had been deprived of so much for so long. Whether Ken had long-range plans in mind or not, he salvaged one of the parachutes and brought it home with him. It was soon after he arrived home that he and Lyla were married. In the days just after the war, material of all kinds was scarce, and wedding gowns were probably at the bottom of the list of rationed goods. Ken and Lila solved that problem by using the silk of the parachute to create a wedding gown for Lyla.The rows of ribbon on the neck and sleeves were made from the ripcords of the ‘chute. Even the thread was salvaged to sew the gown. 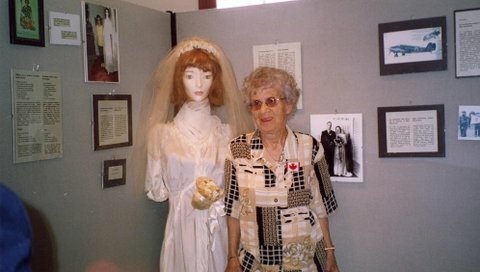 Lyla generously donated the gown to the Chaleur Bay Military Museum, and was present at the official opening of the Museum in 2004. We have the gown mounted on a mannequin and placed in a glass cabinet in a corner of the Museum dedicated to the memory of Hong Kong Veterans. It is one of our most prized exhibits. I sadly report that Jean-Paul Dallain E-30364, RRC (obituary) has died. Paul was one of the toughest men I have ever met. He worked at slave labour in a coal mine in Japan where he developed silicosis. On returning to Canada in 1945, while the rest of us were enjoying the joys of being liberated, Paul languished for months in hospital trying to recover his health. An operation removed one lung and seven ribs. He returned to his hometown, New Carlisle, where he served as post-master until he retired. He kept active all his life, right up until his death. Paul was really one of a kind. We will remember him. Once again our contributors have come up with some excellent articles on a variety of subjects. 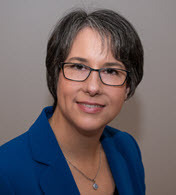 Our President, Gail Angel, has been working hard over the years to help HKVCA fulfill our mission of education, and she has engaged her employer in support of this effort. Read what can happen when someone believes they can make a difference, and exhibits the dedication to make change happen. On February 22, 2017, the present HKVCA National Board approved an Election Committee for a new National Board of Directors. The Committee consisting of Cynthia Melanson, Sharon Kurtz and Chair Kathie Carlson, placed the “Call for Nominations” to all HKVCA members in the March-Spring 2017 Newsletter. HKVCA members were asked to nominate Directors for a new National Board of Directors. Since the Spring-March Newsletter, the Elections Committee has been accepting nominations from HKVCA members across Canada. Nominations closed as of April 30, 2017. As we did not receive more than 12 nominations, an election is not needed. All those who accepted their nomination, are now Board members by acclamation. Congratulations to all the HKVCA Board of Directors for the upcoming year. A report by the Election Committee will be presented at the August Annual General Meeting. The 2017 Election Committee wishes to thank all members for their participation. Finding a watch buried almost 76 years ago! Close your eyes. Go back in your mind a few months- to the beginning of April this year . Not quite spring. Now put your hand out. Keep your eyes closed. How does one explain what it feels like to actually hold the watch that belonged to Rifleman Ray Donald Jackson, RRC who died in the Battle of Hong Kong so many years ago? How does one explain the selflessness of the 5 men in Hong Kong who made it their priority to return the watch they found on Stone Hill- buried where Rifleman Ray Donald Jackson, RRC had been buried in December 1941. How does one explain the quiet discretion of these 5 men who worked together to bring Ray Jackson’s watch home to Canada! When I closed my eyes and held the watch, it was like holding a part of every one of our Canadians who went to fight in the Battle of Hong Kong so many years ago. It is like bringing each of them home for us. 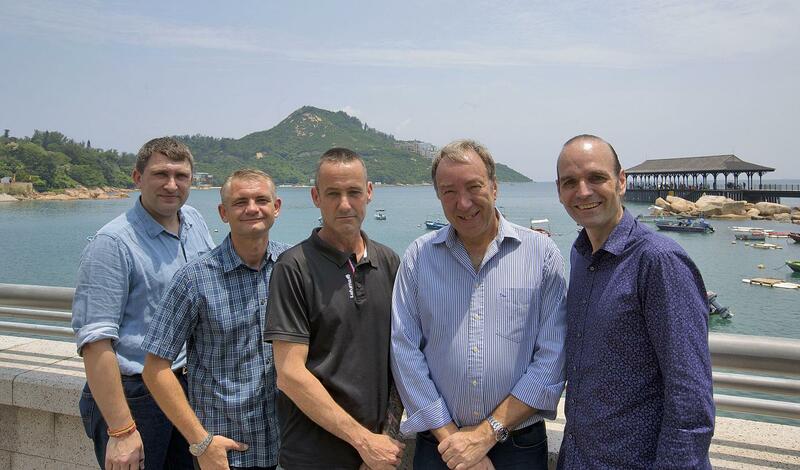 This is WHY the finding of Ray Jackson's watch and the unselfish work of the 5 men in Hong Kong is so very important! Holding the watch in my hand was strangely comforting. And now it is in the hands of the next of kin of Rifleman Ray Donald Jackson, RRC. Dave, Philip, Stuart, Leigh, and Craig we thank you from the bottoms of our hearts! See them in the photo below. There has been lots of media coverage about the finding of the watch. Here are the links, which were working when we checked. Share them with your family and friends. Note: The hill in the background is Tai Tam (Stanley) Peninsula, the last line of defense where the remaining troops retreated to before the surrender on the 25th December 1941. Civic responsibility is something that Gail has grown up with all her life. 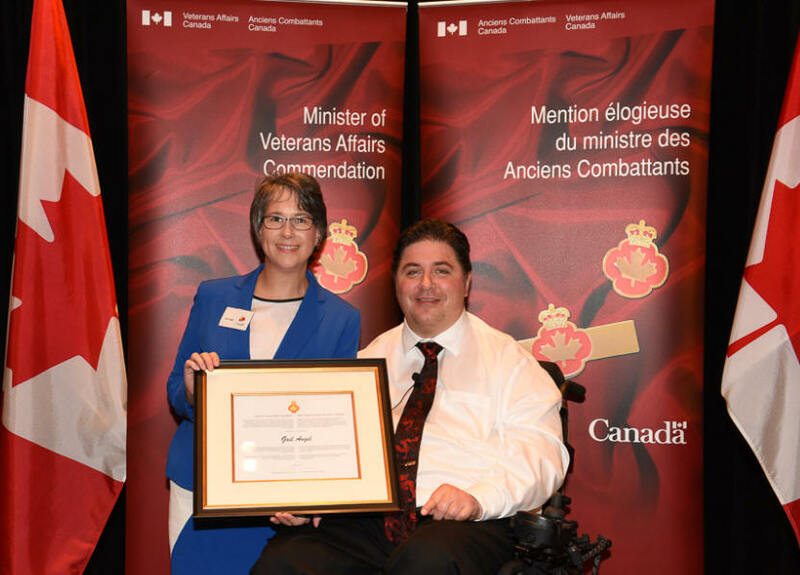 From her grandfather who served as a Hong Kong vet with the Royal Rifles of Canada, to her father who started the Hong Kong Veterans Commemorative Association (HKVCA), it just seemed natural that Gail would one day become the current President of the HKVCA, following in her father’s footsteps. The HKVCA’s mission is to educate all Canadians on the role of Canada's soldiers in the Battle of Hong Kong and on the effects of the internment of the battle’s survivors on both the soldiers and their families. They also assist in the support and welfare of Hong Kong veterans and their widows. One issue that came to light more than two decades ago was the limited coverage this part of Canadian history was receiving in school curriculums and textbooks, not to mention the different provincial standards at play. They knew they needed to come up with a solution to improve the education on this topic. In 2010, it became clear that their collection of free educational resources needed to be fully translated and polished. Gail enlisted a team of 30 IBM colleagues in 2011 to help restructure, refresh, and translate Teachers' Zone, an education site hosted by the HKVCA to teach the many different elements of the Hong Kong story. Commissioned by the HKVCA, and available in English and French, Canada in Hong Kong: 1941-1945 The Forgotten Heroes, made up of ten lessons, is designed for use in history and social studies programs in high schools. Gail got involved with the Teachers' Zone because they were looking for a volunteer to lead the project and her particular skill set was a perfect fit. It was a 12 month project and resulted in a $2,000 IBM Community Grant. When I asked Gail how she first got involved with HKVCA, she explained that her first active participation occurred in 2005, when she helped with registration and other duties during HKVCA’s national convention which was hosted in Ottawa. Since then she and her family have volunteered with HKVCA in different ways. Gail has always volunteered and it comes naturally because she grew up watching her parents volunteer. Her other volunteer activities include recording textbooks for the CNIB, school events, fundraising, conducting a peer audit of her church's annual financial records, church committees, and helping a newcomer build a Canadian resume. Gail’s husband also spends significant hours volunteering, and their children, now teens and young adults, are no strangers to volunteering. The April 21stdeadline resulted in 6	entries received from one Senior High School. There were no submissions from French or Junior High Schools this year. However, it is thought that our low count of entries could be attributed to this year’s milestone of the ‘100th Anniversary of Vimy’, which may have overshadowed interest in our writing competition. The six entries received were from two Grade 11 Social Studies classes at Kelowna Secondary School, BC. Thank you to educators Graeme Stacey and Tina Clarke, who taught their students about the importance of our Hong Kong Veterans stories - and in turn some wonderful entries were submitted. Thank you to our Senior Judges Craig Caldwell and Lori MacNaughton, who recently scored the papers. The judging was tight, where only a small margin of points separated 1st and 6th place. Winning submissions will be published soon. A feasibility study is being conducted to evaluate the book, ‘A Dog named Gander’ – by author and Hong Kong Veteran, George MacDonell. This study will determine if the book should be moved forward as a story of interest for the Social Studies curriculum throughout Canadian Elementary Schools. A test study has begun in New Brunswick, with a focus group of 16 Educators. A balance of French/English, active and retired elementary teachers were chosen. They will provide insight to where this book is - age/grade appropriate and relevelant to current history programs. A book evaluation questionnaire was provided. The study is ongoing with approximately 40% responding to date. Feedback from the English edition is good with some changes suggested. The French version may need some tweaking with translation. Will keep you posted. May you enjoy a wonderful summer with endless blue skies! Our weather in Manitoba is still very mixed with sunshine and rain but at least the plants are loving it. We are in the process of developing a new Winnipeg Grenadier memorial in the Military section of Brookside Cemetery. We are incorporating the existing plaque about Jardine’s Lookout in Hong Kong with a new bronze plaque commemorating the 75th anniversary of the Battle of Hong Kong. The commemoration will take place in September as part of the 150th Canadian birthday. RR Heritage Fair on May 4, 2017 had Canada’s 150 birthday as the theme - Stan, Vince and Alex had our display at the site and helped with the Scavenger hunt. David Stones, the Museum Chairman for the Fort Garry Horse helped me with the judging of the projects for the veteran’s award. The Royal Winnipeg Rifles, the Fort Garry Horse assisted us with prizes for the top three winners. We continue to search for HK vet graves and the families to ensure the grave marker has the distinctive HK patch if the cemetery allows it. As the families of HK vets are downsizing and have memorabilia that needs to be saved for future generations we need to find a military setting for these items. At present many items are located in various museums throughout Manitoba and elsewhere. So we are pursuing the viability of other options and will report on our findings. Carol sent a summary to the National Board of Directors, of the Battle of Hong Kong coin that was issued by the Royal Canadian Mint to the Veterans and widows that we were able to locate. There were 19 veterans and 105 widows who received the coin. The cost was over $14,000.00 for the coin and added shipping costs. We are extremely grateful to the Mint for making this contribution to our veterans and widows. We are very pleased and proud that Kathie Carlson and her election committee did a wonderful job of exercising the election process for the Association. We were saddened at loss of Nada Bell, widow of William Bell WG, passed February 15, 2017 mother to Bill and Dennis Bell (HKVCA members). HK widows Helen Prieston lost her son Larry and Myrtle Lytle who lost her son Robert. Our condolences to our members and their families. Looking for a novel way to celebrate Canada’s 150th? 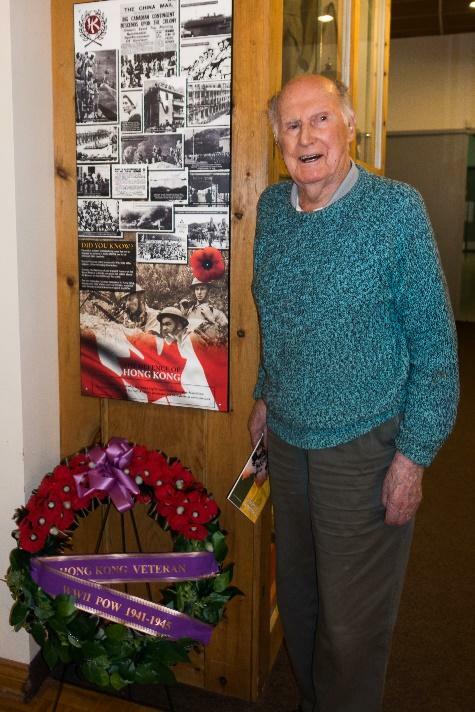 In Ontario Region we’ve begun providing commemorative plaques for installation in places where Hong Kong Veterans have formed an attachment over the years, such as Legions, retirement homes where they may have resided, high schools where they may have made presentations to students and so on. We provide these plaques free of charge. So far, we’ve installed two, and there are several more in the process of being arranged. The most recent installation was at the Royal Canadian Legion in Niagara Falls (A.C. McCallum Memorial Branch 479). Two Hong Kong Veterans, Ken Pifher (RRC, deceased) and 99 year-old Gerry Sunstrum, have been long time members of that branch. On May 13, Gerry unveiled a commemorative plaque in honour of the Battle of Hong Kong, in the presence of 25 or so family and friends and quite a collection of news media. 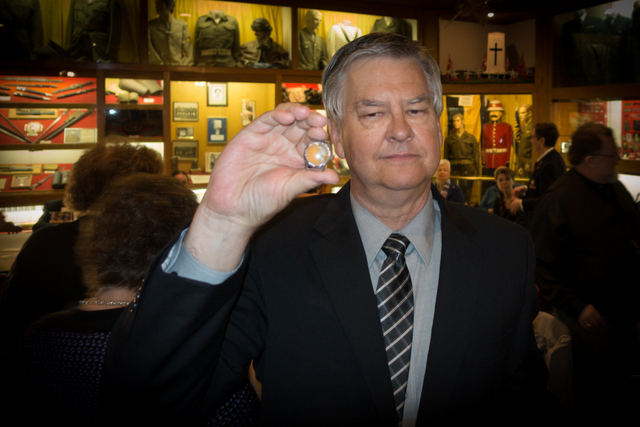 At the same event a watch belonging to a fallen RRC soldier was returned to his next of kin. Read about this amazing story in Lori Atkinson Smith’s article. Ontario HKVCA members who are interested in placing a plaque should contact Lori Atkinson Smith for more details. The Canadian flag on the plaque ties in beautifully with Canada 150 celebrations! Another recent event was the Foundation Day Dinner of the Royal Hong Kong Regiment (The Volunteers) Association. The dinner commemorates the founding of this unit in 1854 as the Hong Kong Volunteers, later renamed the Hong Kong Volunteer Defence Force. Some 2,000 members of this group fought against the Japanese along with Canadians in the Battle of Hong Kong. Many were subsequently imprisoned as POWs, suffering under the same brutal condition as Canada’s soldiers. After the war, the group was renamed the Royal Hong Kong Regiment (The Volunteers), and stayed as such until it was disbanded in 1995. The Association is composed of former members of the RHKR, all of them immigrants to Canada from Hong Kong. They are proud Canadians, and every Foundation Day Dinner begins with a vigorous singing of O Canada. RHKR members have long been strong supporters of the HKVA and HKVCA. They have been involved in our fundraising efforts, our educational work, and since it began, have sent a delegation from Toronto to the Memorial Wall in Ottawa for our ceremonies there. 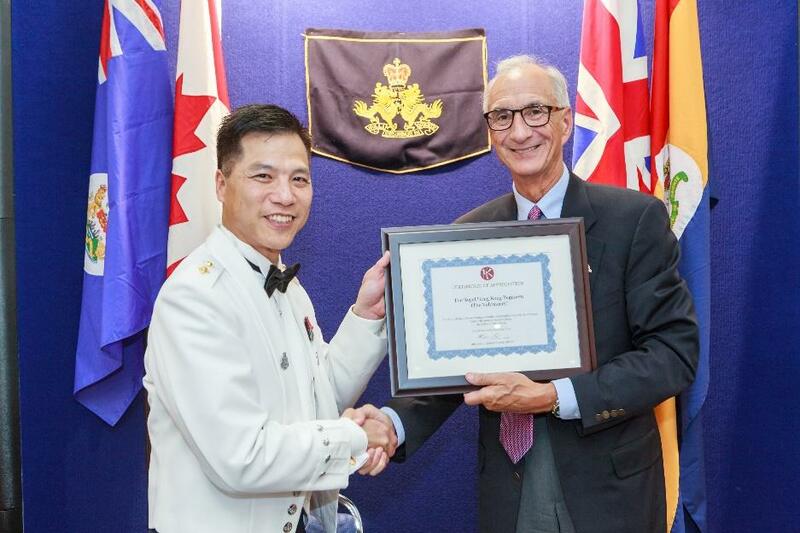 To recognize the RHKR’s terrific support, I was very pleased to present at the dinner a certificate of appreciation on behalf of the HKVCA to the President of the RHKR Association, Lt Larry Lau (Ret’d). On Saturday, May 13 2017, at Branch 479 of our local Niagara Falls Legion, I was excited and privileged to arrange our annual HKVCA spring luncheon which turned out to be something very noteworthy. The 29 people who attended got to see history in the making! Fortunately, it was well reported in the press so I'm sure many are of you are already aware of what took place by viewing the coverage on our HKVCA website. Firstly, our own local, 99 year old Hong Kong Veteran, Gerry Sunstrum, RRC, unveiled a plaque commemorating The Battle of Hong Kong. This is no ordinary metal plaque with words engraved on it, but rather a large (44" X18") colourful , descriptive plaque with photos and short narratives depicting and describing the Battle of Hong Kong. I think it appropriate to mention that another Hong Kong Veteran, Arthur Ken Pifher, RRC, was also a long time member of Branch 479. It is Ontario's hope to mount these plaques in many appropriate venues. Secondly, a watch was found by Dave Willott, a member of a group who use metal detectors in Hong Kong to uncover military memorabilia. What made this discovery extraordinary was that after the watch had been cleaned, an engraving on it's back, "Ray Donald Jackson, Royal Rifles of Canada", became clear. Unfortunately, Ray Jackson was killed in action on December 23, 1941, at 21 years of age. Dave Willott contacted members of the HKVCA, who, working with historian Lillian Randall, were quickly able to locate Ray Jackson's next of kin, Steve Burgess, a great nephew who was already an enthusiast and collector of war memorabilia. 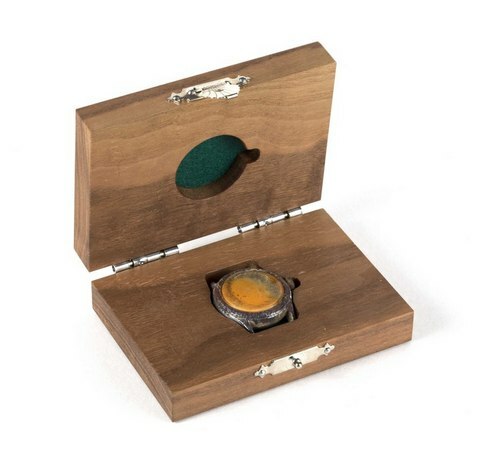 The watch was presented by Lori Atkinson Smith to Steve Burgess, in a beautiful, hand carved walnut box created by artisan Leigh Hardwick. It had the Royal Rifles of Canada emblem engraved on the top. For 76 years that watch had lain in the ground by Stone Hill in Hong Kong awaiting it's eventual, amazing discovery and to be returned to Ray Jackson's next of kin. It was truly an unforgettable event and an honour for all of us present to witness the plaque unveiling and watch presentation. If you are some of the few who haven't seen the press coverage of these two wonderful events, go to the HKVCA website and watch it. You will be as awed as we were. I hope all of you in our HKVCA family enjoy our always too short summer. Greetings fellow members. Summer is finally here for some regions and others are still in waiting. Quebec region has been busy with the regular activities. Our membership is in good standing with still a very few delinquents for 2017 renewals. We are still in the process of upgrading and updating our membership lists in order to have a better contact with all our members. It is a slow process but we will get there. 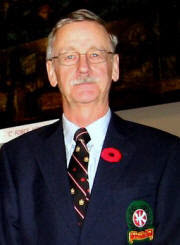 Unfortunately we recently lost a great supporter of the HKVA and HKVCA Jean Paul Dallain, RRC. Paul will be greatly missed by his family, comrades of HK and of the Legion and many friends. WE WILL REMEMBER THEM. Messages of Sympathy also go out to families for the loss of widows, wives and members named elsewhere in this edition. We are participating in some areas of the planning by Les Voltigeurs de Québec for the grand opening in 2018 of Le Manège Militaire de Québec destroyed by fire some years ago, home of the RRC. We will keep you informed as time goes on. They work very hard on keeping the memory of HK alive. Looking forward to meeting many of you during the upcoming August Convention in Fredericton, NB. Have a beautiful and safe summer. Safe travels to NB. Facebook continues to grow as our primary method of keeping in daily contact with our members and the public at large. With over 830 followers, items of interest such as veteran's birthdays are seen instantly. Not on Facebook? Why not give it a try and join our online community. Here's where we are. Birthdate listings on Facebook have generated a lot of activity over on our 'C' Force site, as visitors take the time to click on the link and read the individual reports of 'C' Force members. Typically we see around 50 visits per day. This really helps us fulfill our education mission. We've completed the new 'look and feel' of our various web sites. Not all are done, but the most popular ones are finished. As always, we'd love to hear what you think. Have you noticed a few more HK logo's 'out there'?? Bill Calder, an Ontario member has suggested we use our logo or another HKVCA picture as our Facebook profile picture to help with our 'marketing'. Join us! Let's plaster the HKVCA logo all over FaceBook! You can print a copy of this newsletter right from your browser (right-click and select "Print" in most browsers, or select from the menu) or print a PDF copy which is an exact copy of the paper version.